Soak green gram dhal and urad dhal for about 4 to five hours. Wash and drain the excess water. Put it in a mixie along with green chillies, ginger and asafotida powder. Grind to a fine paste. Remove it and put it in a bowl. Chop the vegetables into small pieces. Add rawa, salt, cut vegetables to the dhal paste. Mix well. If necessary add little water or curd to make the batter to flow like idli batter. Grease idli plate with ghee and put the dhal vegetable mixture and steam cook for ten minutes. 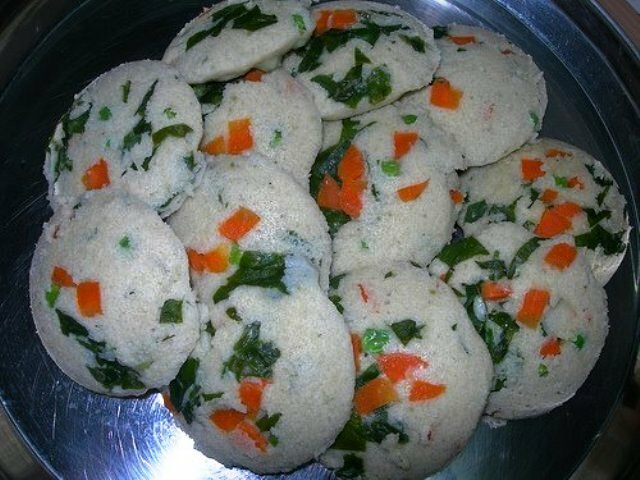 You will get colourful, nutritious idlis. Tips: You can also add mushroom, any other keerai, nuts etc. You can add a pinch of cooking soda to get idlies softer. Hi Kamala, I have a question about this recipe. The green gram dhal being used in this recipe is the split green gram dhal(yellow in color)? I am assuming this from the color of the idlis. Please clarify. One question about the 'Mudakathan keerai dosa'. Would you be able to give me the English or the telugu name of it or even if you could post the picture of the keerai I will try to figure it out. Thanks for your nutritious breakfast recipes. Thank you for visiting my site. Yes it is split greem gram also known as "Payatham paruppu" or "Pasi Paruppu" in Tami. I have posted picture and some details there. Hi Kamala, thanks so much for all the information about the greens. Very informative. So nice of you to take out time and put up all the detailed information. Hi Kamala, I prepared these idlis yesterday. The idlis had a nice taste, but they turned up hard. I was fearing this so I prepared 1 plate as described by you and the other plate by adding a little baking soda to the batter. Idlis prepared with the baking soda were softer and a little fluffy. Could you clarify if your idlis were soft without the baking soda? or did you ferment the batter overnight? Thanks. No need for fermentation. Normally these type of idlies are little harder than the usual plain idli. To make this idli healthy, I do not add cooking soda. If you want soft and fluffy idli, instead of cooking soda, you can add a teaspoon of "fruit salt" like "eno". We can also make this idli with ordinary idli batter, just add vegetables to the normal idli batter and make idli. Onion or garlic chutney will be fine with this idli. However, Kadappa also a good combination.